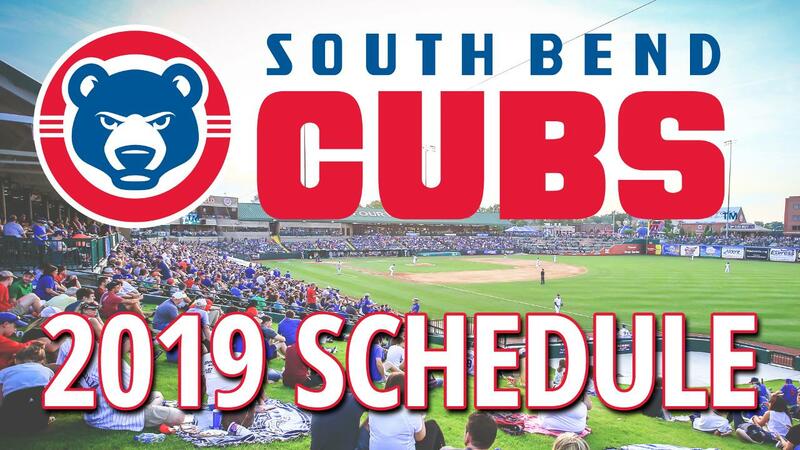 SOUTH BEND, IN -As the 2018 season winds down and while the team is still in contention for a playoff spot, the South Bend Cubs have announced their 2019 Midwest League schedule. "Our ultimate goal year-to-year has always been to provide our guests with the best possible entertainment and ballpark amenities while not only watching the game, but also in their entire ballpark experience." South Bend Cubs Team President Joe Hart said. "I'm very excited for the 2019 season and we will look at all the different avenues to make 2019 even better than 2018." Different from the 2018 schedule, the South Bend Cubs will open their season at Four Winds Field to host the West Michigan Whitecaps on April 4 and 5. They will then travel to Comstock Park to face the Whitecaps for two games on the road. Opening Night will include the first 2019 installment of post-game fireworks. In all, 17 post game fireworks shows are planned throughout the season. Other schedule highlights include games on Memorial Day weekend (May 24-27) and Independence Day week (July 1-3). The team will wrap up the home schedule on September 3 in a three-game series against the Bowling Green Hot Rods. All Monday through Thursday and Saturday home games will start at 7:05 p.m. The exceptions of this start time include April 13 and 27 (4:05 p.m. start), May 8, 29, and 30 (10:35 a.m. start), May 27 (2:05 p.m.) and July 15 (1:05 p.m.). All Friday games will start at 7:35 p.m., and Sunday games will start at 2:05 p.m. with the exception of May 26 (7:05 p.m.). Gates open 1 hour and 5 minutes prior to game time for Monday - Thursday games. Gates open 2 hours and 5 minutes prior to game time for Friday - Sunday games. All game times and promotions are subject to change. There is also much more to be excited about for the 2019 season. The schedule is packed with numerous events, promotions, special giveaways, and more. "In the coming weeks, we will be making a huge announcement regarding the 2019 season," Hart said. The South Bend Cubs are the Class A minor league affiliate of the 2016 World Series Champion Chicago Cubs. Over the past 30 seasons, the team has won five Midwest League titles, most recently in 2005, and has captured 12 division titles. This year, Four Winds Field, home of the Cubs, was named Ballpark Digest's Best Single-A ballpark. In 2015, the team was named Ballpark Digest's Team of the Year and received the John H. Johnson President's Award, the highest award in minor league baseball. The team is owned and operated by Swing-Batter-Swing, LLC whose sole shareholder is Andrew T. Berlin of Chicago, Ill.